We've been a bit spoilt in the Arnold area over the last year or so with a good number of new pubs and restaurants opening. The newest of those is the Eagle's Corner on Front Street. 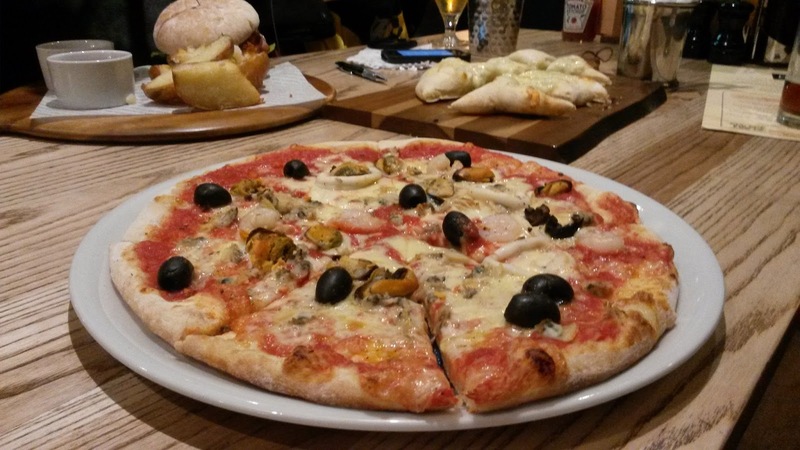 Offering up freshly baked pizzas it seemed worthy of a mid week meal for us this week. 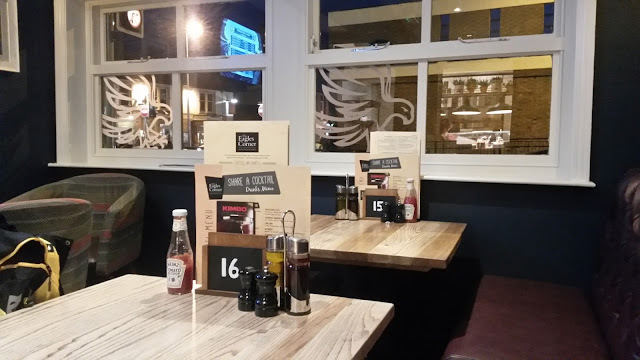 Arnold was originally known as Ernehale (Hence the local JD Wetherspoon's The Ernehale) which translates from Anglo-Saxon as the valley of the Eagles so whilst initially the name Eagle's Corner may seem a little peculiar it does have local significance. The pub's interior is clean, fresh and very Italian orientated. 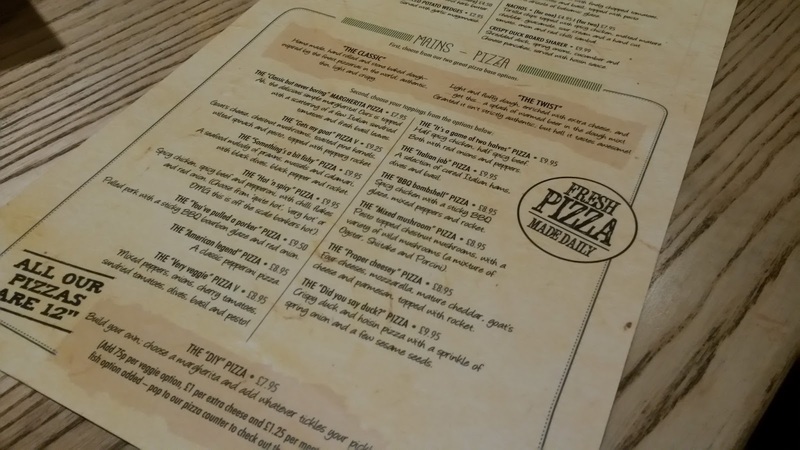 Plenty of Italian adverts adjourn the walls highlighting the prominence of the pizza's and flatbreads on the menu. Plenty of signs and showcased Birra Moretti highlights this aspect too. For a pub specialising in pizza's it seemed a logical choice to go for the...pizza. With plenty of options on the menu I was initially a little shocked to see a simple 12 inch Margarita for £7.95 with the remainder of the pizza menu stretching a pound or slightly more above that. Having eaten some pretty awesome pizzas in Italy for a few euros it was going to take something special for me to want to cancel my next flight out there at the prices the Eagle's Corner are charging. I opted for a seafood pizza at £9.95 with prawns, mussels and calamari. I love a good pizza marinara as I find the salty, meaty textures work well and any excuse for me to have seafood I seem to grab with two hands. When my seafood pizza arrived I felt a little hard done by. 12 inches is a decent size but I was left to count the pieces of seafood per slice. In an 8 slice pizza I was lucky to get 2 pieces of seafood per slice. There were no more than 5 prawns on the pizza and a similar number of mussels. The pizza itself was fine, nicely cooked with slices that held themselves together when you wanted to pick them up although I can't help but think I'd get very similar at the supermarket for a fraction of the price. It was a middle of the road, easy eater but certainly not something I'll be rushing back for unless I'm certainly promised a lot more. In terms of value for money our consensus was that the prices for pizzas were probably £1.50- 2.00 higher than we would usually expect to pay for what was being served up. 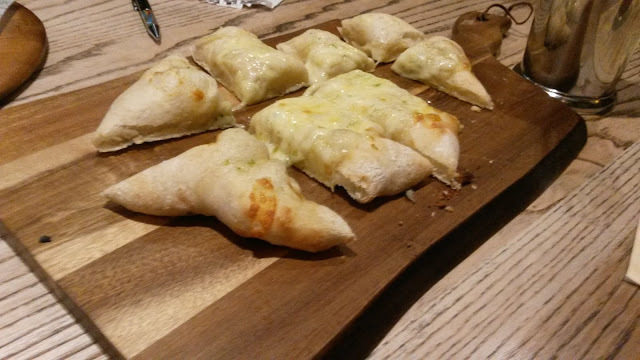 As an extra filler we'd opted for a cheesy garlic flat bread for with our meal. This came out as a good size for sharing with 8 decent sized chunks to get our teeth into. I have to admit it seemed a little lacking on the level of garlic but it was generously cheese topped. We'd also opted for the cheese and bacon burger (£9.95) which came with potato wedges and a nice, warm salsa dip. 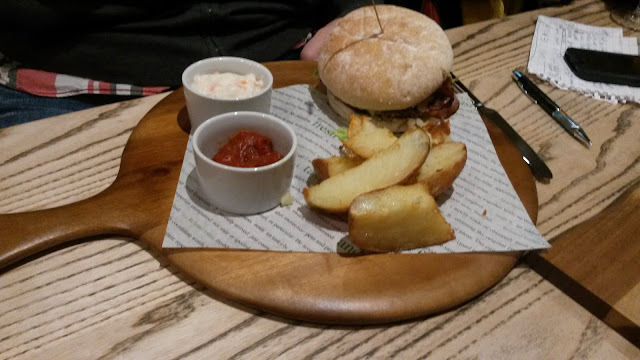 Served up on a wooden board my initial impression was that there wasn't a lot on the plate. This may have been due to the size of the serving board but Mark assures me it that it was very filling and there was plenty to the meal. From the outset the Eagle's Nest looks like it could be successful in Arnold. Without a prominent Wetherspoons or other pub to grab a meal at (The Friar Tuck is now a Flaming Grill and The JD Wetherspoon's Ernehale has seen better days and certainly isn't on a par with the Woodthorpe Top a few miles away) it's poised to make the most of locals looking for a reasonable meal, whether it's friends or family. The menu isn't particularly broad but by keeping things relatively simple they're not over-complicating things. Mark had a nice burger, something he'd have again although in honesty we could very similar elsewhere for a lot more money which is where the pub could lose trade. Like my pizza it was a little overpriced for what was served. A few small changes could help ensure plenty more repeat business.